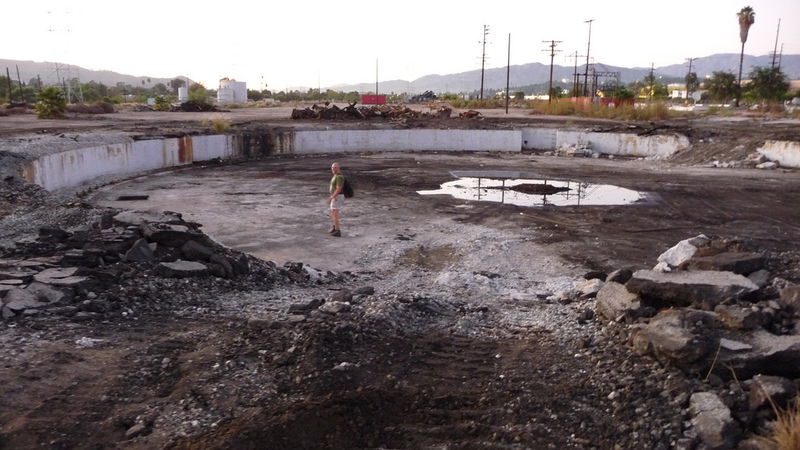 My friend Nate and I bicycled out to Taylor Yard to survey and photograph the destruction. The white buildings that I’ve seen there for the last 20 years are no longer standing. It’s an odd moonscape. I still don’t know quite why the demolition is proceeding right now… who is paying for it… and why? I will try to get answers this week. If any readers can shed light on it, please do. I am a little worried that it could be some mischief afoot… such as when a developer purchased the nearby Taylor Yard parcel where the Los Angeles Unified School District is building a high school. The developer immediately proceeded to pave the site to supposedly increase its value? The whole thing complicated the school district’s acquisition, devolving into a legal eminent domain battle. Check out more photos of the destruction that was Taylor Yard at Nate’s photo page. Regarding the city’s acquisition of the Albion Dairy site (and just how many separate blog entries L.A. Creek Freak is capable of squeezing out of a good big story), it seems like a lot of folks read the word “dairy” and get this very pastoral image of cows and rolling grassy hills. So L.A. Creek Freak headed out to Lincoln Heights this morning to bring our readers some photos of the site as it exists today. Don’t let the word dairy fool you. You can see the site is indeed a fully-paved, industrial distribution center. Lots of 18-wheeler trucks, loading docks, basic industrial buildings, cars a-parking… not a blade of grass to be seen. As our readers can see in the photo below, the Los Angeles River in this area is all concrete. Also visible in the photo are the two active railroad tracks that run between the river and the dai… er… distribution center. In the long run, as river-adjacent properties like this one are acquired, possibilities open up for river access above or below the rails, like these possible design renderings (see the four images at the bottom of the link) for the nearby L.A. State Historic Park. Lots going on that many L.A. Creek Freaks will be interested in. >There’s a big buzz on many graf-art websites about the U.S. Army Corps of Engineers’ use of federal stimulus funds to paint out the famous/infamous huge SABER graf-art mural on the west bank walls of the L.A. River downtown. I am not the biggest proponent of graffiti at the L.A. River (I think that some of it is great… but some of it I find kinda frustrating) but this whiting-out project seems pretty pointless to me. There are many greener projects that could have moved forward with those federal monies… which were supposed to create green jobs, no? >TreePeople has a good-looking new website, including a new blog by their founder Andy Lipkis! > The Water Wired blog is a great very readable resource for coverage of very fascinating water issues happening all over. Put it in your RSS Reader today! You might want to check out their recent coverage of Mexico City’s water issues from centuries of overpumping and on the New York Time’s coverage of nationwide neglect in enforcement of the federal Clean Water Act. The actual New York Times article by Charles Duhigg Clean Water Laws Are Neglected, at a Cost in Suffering is here. Duhigg was interviewed on Demoncracy Now earlier today. >Mark Gold penned an editorial California’s water reform legislation is all wet that ran in the September 8th 2009 L.A. Times. Gold’s Spouting Off blog is also a great read. >Bill Campbell at Metblogs shows off Ballona Creek’s beautiful new Brett Goldstone gate at the bike path entry point at Inglewood Avenue. Bike over and check it out! >The “eecue” site has posted even more great photos of the downtown Los Angeles L.A. River bridges. >The L.A. City stormwater program’s blog “L.A. Team Effort” details the city’s plans to use $30M in Proposition O funding to upgrade city Santa Monica Bay stormdrain dry weather diversions. During dry months the city sends the trickle of urban runoff from many stormdrains into its sewage treatment plans. This prevents contaminated runoff from getting into rivers and oceans during the summer – when recreational usage is highest. >The Ballona Institute is looking for volunteers at a Ballona Wetlands clean-up and restoration event this Saturday September 19th from 9am to 12noon. For information, send an email to massa30 [at] gmail [dot] com. >The free Frogtown Art Walk takes place this Saturday September 19th from 4pm to 10pm. >Lots of great creek, river and beach sites to choose from on Coastal Clean-Up Day this Saturday September 19th from 9am to 12noon at more than 70 locations in Southern California! >Food and Water Watch hosts a talk by Bolivian water activist Marcela Olivera – Saturday September 19th at 4pm. Details here in our earlier post. Creek Freak is pleased to share the following emails from Tim Kirk who, with his daughter Briar, has been exploring the Los Angeles River. I really like what he has to say (below) about our waterways giving us some sense of place. He says it better than I’ve summarized it – read below. I present his words here, though I’ve added a few links and interspersed some of his photos. Click on any of the photos to see larger images at Tim’s river photo gallery. Thanks, Tim for promoting my book, so I don’t have to. I wanted to thank you for your excellent book on the LA River. My daughter and I are walking the LA River in pieces. We started when she was 5 months old and she is now 15 months. Our first treks were in Atwater Village and headed south through Frogtown. We walk 2-3 miles, looking for a place to pick up our trip next time. Having completed this, we then headed north and, in this fashion, made our way through all the walkable parts of the river up to Lake Balboa. We did a few side trips to tributaries along the way. We just discovered your book. Our good friend, Dominique Dibbell sugggested it (she interviewed you when she was editing the Sierra Club magazine.) It has been a blast to read about the areas we have already walked. We are now headed south and have done two of your walks (Chinatown & The Estuary). We are also exploring the Arroyo Seco. Here is a link to our flckr site with an ongoing photo essay of our journey. I hope you get a kick out of it. Thanks again and if you see us walking along, say hey! We’ve been busy on the river. We made that final trek down to the bay in Long Beach, which was a blast, and the reason for this note: to thank you for the excellent description in your book of the parking situation, and the byzantine trek from there to the river — I doubt we would have found it otherwise. We had a fun hike today. We’ve been heading north on the Arroyo Seco, and finally connected with an earlier walk, at the Archery range. Next, we’re going to see if we can find a spot to continue, above the Rose Bowl. Here’s the link again, if you want to see some pictures. This continues to be a cool experience to share with my daughter, even more so as she gets older — now nearly 16 months. I know that traveling the river has changed my head significantly, my geographical sense of LA has shifted and I feel a certain sense of connectivity between the disparate parts of the city that the river links. I’m excited for Briar to grow up with this awareness, which I hope will be part of her identity as an Angeleno. South East Trees' Latest Masterpiece! > The new Cudahy River Park opens along the southeast stretch of the Los Angeles River! What will North East Trees think of next? > L.A. Streetsblog looks at federal stimulus money going to California bicycle projects – looks promising that funds will go to the lower Arroyo Seco Bikeway. > Friday-tomorrow noon is your deadline for entering L.A. Creek Freak’s first-ever contest. Win the Audubon Center at Debs Park’s guide to Animals of the Los Angeles River by merely commenting on our blog. Right now the odds are better than 1 in 10. No purchase required. Void where prohibited. Your results may vary. >Tomorrow, Friday April 17th at 2:30, the City of LA hosts a talk on the revitalization of Seoul’s Cheong Gye Cheong river. >This Sunday afternoon, April 19th, Long Beach’s Wrigley Area Neighborhood Alliance hosts tours of the Dominguez Gap – a restored wetland park along the lower Los Angeles River. Creek Freak visited the site recently and the wildflowers are blooming beautifully! >Also this Sunday, April 19th at 3:30pm, Friends of the LA River hosts a walk along the scenic Glendale Narrows stretch of the L.A. River. Meet at Steelhead Park, on Oros Street in Frogtown. >Support your local bloggers Joe Linton and Damien Newton as we teach you how to blog like we do – plus mucho other useful free stuff on the web at our Internet Skills Class on Tuesdays April 21st and 28th. We teach it again May 4th and 11th. > This Saturday April 18th at Taylor Yard with North East Trees. Yo! it’s Earth Day! > Next Saturday April 25th at Taylor Yard with North East Trees and local Obama folk. >Saturday May 9th at Taylor Yard and many many other sites with Friends of the L.A. River. >On April 25th and 26th, Urban Photo Adventures leads their Los Angeles River photography tour – see and capture some of the grittiest industrial sites along the mighty Los Angeles. You are currently browsing entries tagged with photography at L.A. Creek Freak.